Eating healthily is crucial to living long and fruitful lives. Without getting proper nutrition, a person could put themselves at greater risk of developing infections and chronic diseases. However, making the right food choices can be difficult in this fast-changing world. Most of the time, processed food may seem like a better choice since they are more convenient and much cheaper. 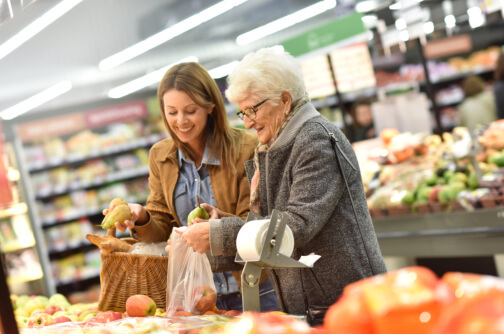 Because eating healthy usually takes time and effort, seniors may find it even more of a struggle now than they did in their younger years, especially if they are recipients of skilled nursing services. Making a shopping list and planning ahead of time is vital if your goal is to have a successful trip to the grocery store. Having a list before going shopping serves as a surefire guarantee that you grab only the necessary essentials, thereby keeping your budget in line. You may find it a good idea to have a running list of your stocks on your refrigerators so that you can easily check whether or not you still have a supply of these items. Additionally, grocery lists can also help you determine if there are any items that you can cross off in order to save more money. If you need assistance, you can always get in touch with our highly trained caregivers at Magnolia Home Care Service at 912-319-7273. Don’t ever go to the grocery store hungry. Otherwise, you will certainly end up spending more than you originally intended. Instead, we recommend that you eat a light meal before venturing to the store. Just ask the caregiver who is providing you with personal care in Georgia if you need any help. This entry was posted in Senior Care and tagged Grocery Store, Senior's Health, Senior's Shopping Tips. Bookmark the permalink.